If you follow me on Twitter or Instagram (if not, why not?!) you’ll know I’ve recently returned from a 10 day trip to Greece. 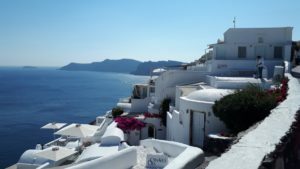 This was split into two parts; 3 nights in Athens on mainland Greece, and 7 nights on the island of Santorini. It had been in the planning, technically, for 13 years; the Santorini part, at least, since we first got together. I included it on a travel bucket list a couple of years back. 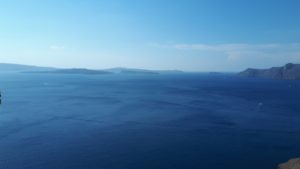 The Athens part was an add on – a “makes sense to do it while we’re in the area”, if you will. .
Oh, and it was also our 10th wedding anniversary trip. No pressure then! So, here’s the deal. When you build something up in your head, you want it to be perfect, right? And when it’s not immediately perfect, it freaks you out, right? Welcome to our holiday to Greece. 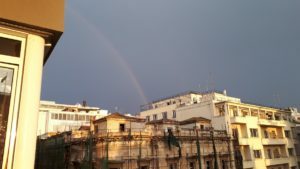 We arrived in Athens and it was raining – strike 1. The hotel room looked nothing like the pictures on the website – strike 2 (although kudos to their photographer for polishing what wasn’t quite a turd, but wasn’t the luxurious dwelling we’d been led to expect). 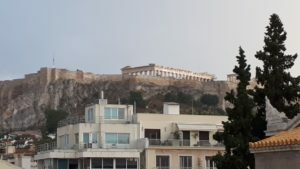 Although it did have the promised Acropolis view from the balcony. The husband couldn’t get a draught Mythos (Greek beer) as we sheltered from the rain – strike 3. It wasn’t the positive start to our trip I’d hoped for. Now, whilst this is completely irrational (as am I), when things don’t go smoothly on holiday I feel responsible. As the organiser it’s my responsibility to make it great. I know I can’t control everything (e.g the weather), but I also take that as a personal affront. It’s one of my quirks. But when the sun came out and a rainbow appeared, I hoped for the best! Fast forward then 3 days, to our arrival on the beautiful island of Santorini. Our pre-booked private transfer wasn’t at the airport when we arrived – strike 1. Once again our hotel room wasn’t as expected – strike 2. But the biggest kick in the teeth of all, Oia, the “village” we were staying in, was really really crowded. Uncomfortably so. There were selfie sticks, and walking tours, and cruise ship visitors desperately trying to cram in the essence of the island in a few short hours. Obviously you can’t tell from these pictures! But neither of us felt the burst of love we’d hoped for after 13 years of wanting to visit. I’ll save you the sleepless nights until I share my full travel posts, but it all ended well. Better than well, in fact. The Athens room was just a base, so not the end of the world. The beer got better. We saw some amazing sights. And, as for Santorini, the room was really really nice, once we adjusted our pre-conceived expectations. And Oia is the most beautiful place I have EVER been to in my life. It’s just a case of timing it right and avoiding the crowds, which we managed on multiple occasions. « Who thought self hosting was a good idea? You have such a great attitude and I love your positivity. Im a huge believer that what is meant for us wont miss us, so I am sure something fabulous will come along!